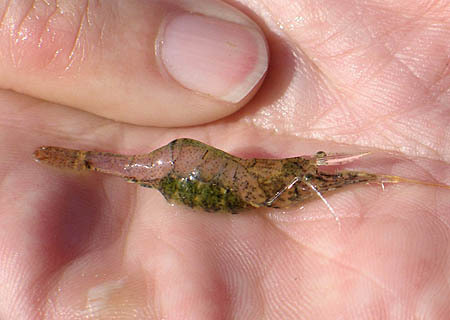 Native Range: This shrimp ranges from northeastern Mexico, Mississippi River north to the Great Lakes and east to Florida (see Page, 1985; Fig. 87, p. 360). It is sporadic in the central US, west of the Allegheny Mountains, and from the Gulf of Mexico to Canada (Pennak 1989). Table 1. States with nonindigenous occurrences, the earliest and latest observations in each state, and the tally and names of HUCs with observations†. Names and dates are hyperlinked to their relevant specimen records. The list of references for all nonindigenous occurrences of Palaemonetes kadiakensis are found here. Means of Introduction: Unknown, could be a natural range expansion. Page, L. M. 1985. The crayfishes and shrimps (decapods) of Illinois. Ill. Nat. Hist. Surv. Bull., 33(4):335-447. Pennak, R. W. 1989. Fresh-water invertebrates of the United States, 3rd ed. John Wiley & Sons, New York.